The MV Agusta is one of those rare bikes which once you set your eyes on it, looking away will be a battle of wits. Its look is so appealing that it could be bought and used just for a house ornament. These Italian giants in the motorcycle industry are so good at getting a lot of hype surrounding its bikes that this one is no difference. When you look at any of the MVs, you can tell how unique they look; unlike any other bike in the history of motorcycles. With a closer on the MV Agusta, one can’t help but appreciate the harmonious blend of curves and angles on the bike to give it the best of shape, alongside finishing touches that come to complement the paint resulting in the most admirable looks. This is definitely the proof that when you build a motorcycle caring more about the end result and less about the budget, such is the marvelous result you get. 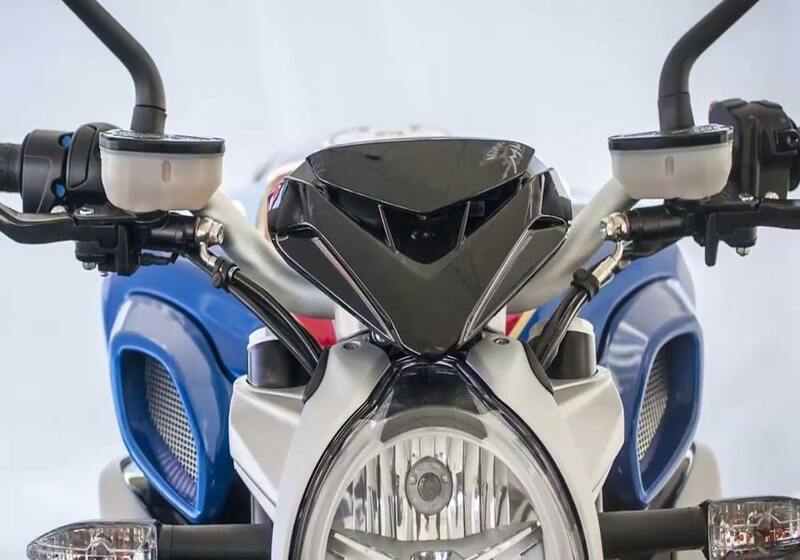 From a structural point of view, everything is just awesome; A well designed tank which flows with all simplicity into the part that carries the seat; with a single handed swingarm, all of the rear wheel is shown off in grand style; with a triple exhaust that is found at the tail end of the bike, the sound coming from them is just one of a kind. Around the right leg, we have a relatively huge emission stickers which practically damages the great looks of the motorcycle but thanks to the cool and great nature of the black forks, which are 43mm, the damaged look is kind of masked off. In a nutshell, a lot has been put together in order to give the Augusta Brutale the slender looks which it can be proud to boast of. If it were only for these looks alone, the MV Agusta would have surely been the pearl of pearls and it goes without saying that most of its owners are extremely delighted with what this bike looks like. It should be noted that the MV Agusta Brutale 800 is a beauty on the outside as well as on the inside. With its high performance, its owners believe they have had their money’s worth by making such a deal purchasing this motorcycle. Though this motorcycle may not be a beginner in this series, all together it forms a great system. Within which we have the ABS with rear wheel mitigation, the bike in itself has eight different traction control levels and all these are quite easy to handle as will say most owners of this motorcycle. Even when it comes down to the bike riders who are barely getting their head in the game, say the intermediate riders, the bike is still good enough for them to get to build their skills. Well, the better side of it being the intermediate rider is; that as you get to build the skills, later you become an expert, enjoying the bike to its full capacity. It is also worth noting that the MV has quite a high seat. An average height human being may be able to just sit and have his or her feet on the ground but with quite limited movement. On the other side of it, looking at the Brutale from one end to another, at barely 55.2 inches of length, one can say it is quite short. This is clearly proven when the bike is compared to other motorcycles of its same class. The MV is over two inches shorter than they are. Its geometry can be considered as not excessively aggressive given that its 24.5 degrees of rake is identical to that of the Z900 motorcycle and is barely ½ a degree less than the FZ-09. Such geometry coupled with a relatively small weight and the short wheelbase are what make this motorcycle so agile. One may think that with this handling, it may be nervous but on the contrary, it is quite sensitive to the input from the handlebars as well as the road bumps. Amazingly enough, the MV Brutale does not come equipped with a steering damper and it actually doesn’t even need one. This is clearly proven when riders get to enter potholes and within the twinkle of an eye, the handle bars have already adjusted to the problem by settling back in place with little or no issues. Even right down to the chassis, there is still that harmonious setting as makes the connection of the rider to the bike seem so effortless. Any rider who gets to sit on this bike immediately realizes that spanning from the tank to the seat, the rider triangle is short,. That not withstanding, you immediately get that sense of comfort and feel so confident about yourself as you get to sit down on the bike. In general, when seated on the bike, you have an upright position though there is quite some weight on the front of the bike, this altogether make the experience an awesome one. With the handlebars which are quite wide as compared to the shoulders-width, and being quite sensitive to input, you can’t help it but enjoy your ride. Most riders get to avoid the foot pegs given the conventional position. As though it were not enough, the footpeg on the right side is placed quite close to the three exhaust pipes; more reason why people will avoid them. When you happen to take a look at the Ducati Monster 1200, then you understand that this is no big deal. Despite the great looks and comfort, the MV also has its downside. One if which are the suspension of this motorcycle. One has got to admit, there is quite an issue with these. With the Marzocchi 43mm that are found in front, though they of great quality there is some stiffness attributed to them which doesn’t go unnoticed easily. It is worth making the difference between “stiffness” and “hardness”. Though they may be stiff, both front and rear suspensions work harmoniously together to give that feeling of extreme comfort. Riding Experience from most drivers has brought the same conclusion; if you ride with MV using its default or better still the factory settings of the suspensions, you may end up having the feeling of all the bumpy sensations being transmitted through you. On roads with horrible surfaces, the bike may end up bouncing about so much so that you will feel like your confidence has been compromised. So the advice to every other novice or intermediate rider is that if you going to be riding on a track, you may want to leave the settings of the suspensions just the way they are but if you are going to be using it on every other kind of street, you are strongly advised to soften things a little bit for a better experience. Structurally, the suspensions are disposed in such a manner that the adjusters are at the topmost position, making them very easy to be adjusted. Meanwhile The compression damping is in the left fork of the front suspension, the right fork has the rebound damping. Unfortunately, this is not quite the same with the rear suspensions as we have compression damping adjuster which is rather located at the top of Sachs shock. This leaves it almost obscured by the left section of the chassis. One of the ways to get to adjust this suspension is by using a skinny Motion Pro screwdriver to reach it but truth be told, this is not much of an easy task. I backed the compression damping adjuster out by two full turns on the fork leg, and a half-turn out on the rear, which incidentally put the shock at the minimum damping setting. The improvement was dramatic, and the changes allowed the suspension to really shine.